Reliability and availability are critical to Hiperbaric. We work hardest in order to create a worry-free environment for all our customers using our technology. Expecting a reliable high output from your processes, we set the goal to help you reduce downtimes to a minimum. From installation and commissioning, scheduled overhauls, on-site repairs to spare parts, we are ready to serve you. With our diagnostic services, we can even identify faults before they become failures and with our remote monitoring & diagnostics capabilities, we can help you instantly. Our specialists are devoted to providing reliable and continuing support. Anywhere, any time. 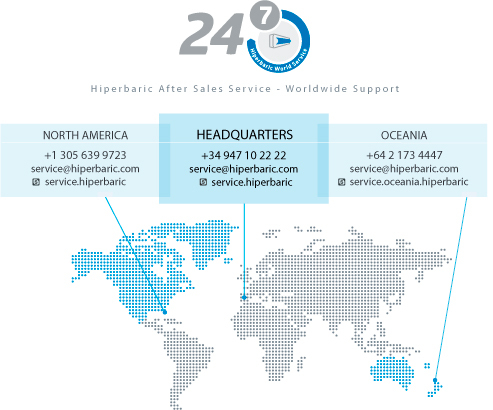 Supporting customer service commitment, Hiperbaric After Sales Service employs highly qualified field technicians around the world. Wherever your plant is located, our specialists know your market and your technology, and they are available with rapid-response solutions that translate into measurable benefits. Schedule Service & Planned Repairs. Fully understanding and control of the technology by the customer (Through Training Sessions). Knowledge of operating parameters (ambient conditions, operating mode, etc.) and component design, manufacturing parameters and tolerances. Advanced tooling and maintenance processes made available through continuous R&D investment. A full Hiperbaric warranty on work performed and on most components and assemblies repaired.